﻿ How to Maintain Motor Graders for Fine-Grade Accuracy? Achieving fine-grade accuracy through the motor graders to the tune of specific millimetres required for any job is an extremely difficult task. Even trained and experienced operator may not be able to achieve the required accuracy if the motor grader is not in good shape and properly maintained. One of the major problem in achieving the specific grade result is improper adjustment of the turn circle and blade lift contact points. Thus, as per the experts, operator experience, circle adjustments and visibility are few factors that can surely help in achieving fine-grade accuracy. Industry experts believe that most important maintenance items of the motor grader are in the circle and moldboard system, circle wear inserts, cylinder ball joint shims, moldboard cutting edges, circle and pinion teeth, moldboard pivot joint and saddle assembly. As more and more play is introduced in the system as these components wear, it can prove to be harmful in the longer run. In fact, if there is play in the system, then even if the operator tries to reach a specific grade, the elevation of the cutting edge may change. In such cases, even the electronics of the machine or operator can’t detect the change and the result can be the final grade which is not up to the mark. Typically, after every shift every day, the turning circle, lift cylinders and moldboard slide should be checked for any play. Here, the role of operator comes into picture as it is he who needs to check whether these areas have started to wear and require adjustment and/or replacement. In fact, operator can better know when the time for maintenance is. Further, it should be noted that if the joints become too sloppy and loose, then they can negatively affect the finished surface. In order to check for the excess wear, the drawbar, circle and moldboard should be lifted off the ground. If the lift cylinder rods move without immediate cutting edge movement, this linkage is considered loose and needs to be adjusted properly. Another point towards which attention should be paid is when the moldboard slide rail is out of adjustment, then the moldboard may start to chatter which is when the moldboard wiggles back and forth, fore and aft. A washboard effect can be created on the finished surface due to this. Hence, an inspection should be performed and for that the end cap for the slide rail inserts should be removed. Then the moldboard should be lifted in the air and gaps between the insert and the rail should be checked. For checking the drawbar wear inserts, the moldboard should be raised off the ground and then inspected for a gap between the wear insert and the drawbar plate. The other thing that should be checked regularly is cylinder ball joint wear which can be very easily seen from the operator’s seat. You should also make it a point to eye the upper saddle assembly and trunnion. They should be serviced as needed. Last but not the least, speed and power of your circle turn can play a very important role when positioning a blade for final grade. A good operator should constantly adjust the circle turn and blade lift as per the need. Experts suggest that the clearance of the blade lift cylinder ball and socket arrangement should be checked every 250 hours. 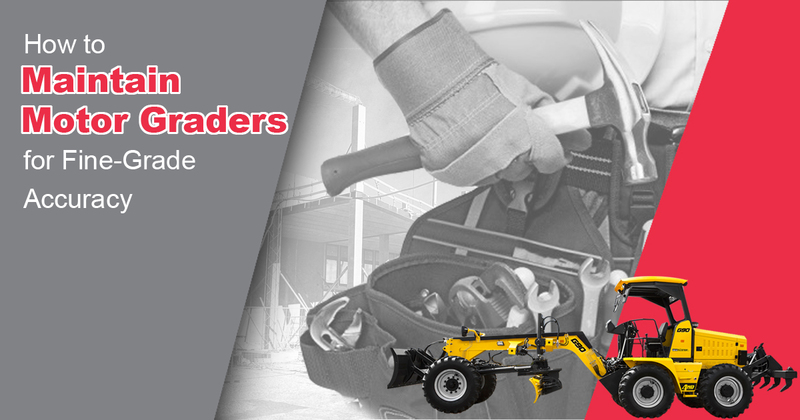 It is the cutting edge which helps the motor grader in maintaining the accuracy of a cut. Hence, it is extremely necessary to replace it if it is worn out unevenly. Cutting edge wear can occur in the middle as well as the corners creating an uneven surface. The edge should be replaced before wear occurs on the bottom of the moldboard and reduces cutting edge support. For cutting edge replacement, there are no fixed rules. If the cutting edge sees even wear across the entire length of the edge or the edge is properly maintained, then accuracy may not be sacrificed. At the same time, the productivity will also be constant until the edge is worn down to the point that the cutting edge hardware is contacting the surface. Generally, it is seen that the life of the edge depends on the operating conditions, blade down pressure and how abrasive the material is. The tires and transmission which constitute the drivetrain play an important role in achieving accuracy of the final grade. Inconsistent tire pressure can have a negative impact on the ability of the equipment to reach the final grade. Here, it is to be noted that all the tires should have the equal pressure. This is because it changes the blade height, requiring a recalibration of the grade control system. Unequal tire pressure can also affect traction and the machine response. Attention should also be paid to the tread pattern. Some tire tread patterns are better suited for finish grading than others. The final grade is also affected by the lug pattern. When the discussion is about the tires, then it should also be noted that even mismatched tires can create a huge problem. Hence, it is necessary to use the same size tires of the same type and same age (tread). When it comes to the drivetrain, then the most important thing is to have a selection of ratios in the working range of the machine. These days, the modern grade control systems allow you to make fine adjustments and tailor a motor grader for optimum performance. However, merely understanding the grade control system is not enough. Understanding of the equipment is also of vital importance. In addition, proper maintenance of both the motor grader and grade control system is necessary too. Lack of knowledge on the part of the operator can mean that all the technological features are not put to use which may affect the final result. Mastering the moldboard, circle, drive train and technologies can greatly impact the motor grader’s performance and help in achieving the fine-grade accuracy.